In Linnenbrink´s work one thing is encountered above all else: color. Pure luminous and pulsating color. Colors seem to communicate and do something to us. Color is at the heart of Linnenbrink´s artistic work – along with its full wealth of emotional and psychological impact. 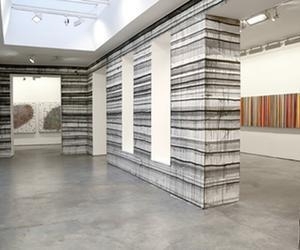 It makes no difference whether we are face-to-face with one of his large format images, in which he allows the pigments dissolved in epoxy resin to run slowly down the picture carriers in satiated, glistening vertical stripes; or whether we study those works in which small drilled craters disclose many apparently archeological layers of paint, or find ourselves in one of his site-specific, all-over paintings that cover the walls, floors and ceilings, their iridescent stripes of color subduing entire architectures and permanently altering the viewer´s perception. There is also a performative quality in his works, which becomes clear not only when Linnenbrink pours the resin with its added pigments onto the image carrier, or drills holes in the hardened paint layers of some paintings. It also becomes particularly obvious in the case of his mural works. These are color-spaces that oscillate for the viewer between two- and three-dimensionality. With all this, the artist explores the image of time, using the methods of the plastic arts as a way of recreating the behaviour of this slippery dimension. Markus Linnenbrink (Dortmund, Alemania, 1961) lives and works in Brooklyn, New York. He studied painting in Kassel and at the Hochschule der Künste in Berlin. His works have been exhibited internationally, from Seoul to New York, San Francisco or Chicago, in addition to many German cities. Worth mentioning are his solo exhibitions at the Hammer Museum Los Ángeles, USA; Kustverein Gütersloh, Germany; the Märkisches Museum, Witten, Germany; Museum Neue Galerie, Kassel, Germany; among others. As well as his participation in international group shows such as the San José Museum of Art and the Bedford Gallery of the Lesher Center for the Arts, both in California, USA; Queens Community Houses, New York, USA; the Cleve Carney Art Gallery, Chicago, USA; the Visual Arts Center, Richmond, USA; the IV Biennial of Beijing, China; Kunsthalle Nuernberg or Kunsthaus Rhenania, Cologne, Germany. Today Linnenbrink´s radical color positions can be found in numerous private collections such as Deutsche Bank and Commerzbank, Germany; AXA Insurance, Luxembourg; The Art CollTrust, Bank One, Harvard University, UCLA Hammer Museum ; San Francisco Museum of Moden Art, USA; Herzliya Museum of Art Israel; Colección Olor Visual, Spain; and many other institutions. His permanent installations include the Philadelphia Academy of fine Art Museum, Philadelphia, USA; the Center Court, The Hague, Netherlands; and the City of Stuttgart, Germany.